The "Special Information" briefing for my next pro event listed the following text: "The tournament will be attended by Royal Highness of Negeri Sembilan". I had so many questions. And I couldn't exactly point to where the Malaysian state of Negeri Sembilan, or it's capital, Seremban, was on the map but at my level in the pro ranks when you're given a spot into any main draw, you take it, and when you're told someone named the Royal Highness of Negeri Sembilan will be attending, well you just grab your bags and head straight for Seremban. So that's what I did. Palm trees dotted the landing strip in Kuala Lumpur as my overnight from Australia touched down into some sort of early morning dense layer of something - fog, steam, clouds, snow? Being it was 91 degrees outside I crossed off snow but couldn't narrow it down further- not until a blanket of all the other options smacked into me outside the airport, officially commencing my visit to Southeast Asia. The Malaysian guys I met on tour told me the seasons here were "hot, hot, hot and hot" and that felt about right. Already sweating bullets I read off what I was told to do next: train to Bandar Tasik Selatan, taxi to Majlis Sukan Negara, Bukit Jalil, Gate C. I was told any taxi driver would know where it is, which I've learned is actually code for no taxi driver will know where it is. Sure enough four circles and five friendly "where are we?" in Malay conversations later and a napping Addeen Idrakie was notified in his dorm room at Majlis Sukan Negara, Malaysia's National Sports Complex, that his foreign friend had arrived. 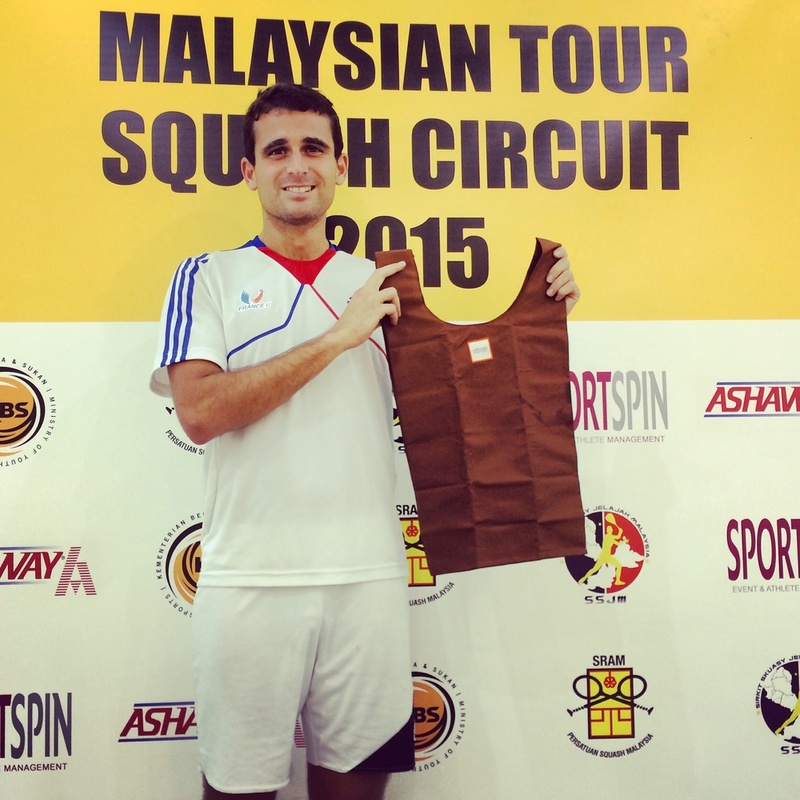 I had met Addeen during the New Zealand tournament circuit back in June and he was nice enough to invite me to crash with him and his four squash roommates in their dorm room at the complex in Kuala Lumpur, and train there for the weekend before the tournament. It was like an Olympic Village but just for Malaysian athletes- an intensive training institute where the only students are its country's best athletes across all sports. Limited internet access, no social media, no distractions. The mission: eat sleep study and train, with all expenses funded entirely by the Malaysian government to develop their future Olympians...And on occasion, to let a wandering American player crash the party. Lunchtime in the cafeteria felt like a SportsCenter commercial, Malaysian edition: over there are the soccer players, walking past are the gymnasts, sitting down now is a top sprinter. I powered through my chicken and rice next to the sprinter, made fast friends with the omelette chef, watched Asia's Got Talent with the soccer team and tried my best to blend in. Athletes were everywhere as one player pulled around his scooter and I held on tight as we took off for squash practice. We hit on the all-glass court surrounded by stadium seating in the Nicol David Arena, proudly honoring the Malaysian native who is the current and 8-time world champion, one of the best ever to play the game. Our shadows danced under the bright flood lights above the court as the ball zipped around the glass in the otherwise empty, hollow Nicol David Arena. Adrenaline spiked and for an hour inside inside her stadium, you quietly pretended to be a world champion too. Addeen had to leave campus unexpectedly so his squash roommates, without skipping a beat, took over. They led me past the sport stadiums and down the side streets, in a taxi around street vendors and past the mosque goers and toward a table at their favorite restaurant, a non descript outdoor Malayasian barbeque joint somewhere in Kuala Lumpur. I barely knew Addeen, and didn't know any of these guys who were now showing me their go-to spot, asking me how I am enjoying Malaysia and refusing to let me pay for my meal. All little things. Little things I'll remember most. At dawn on Monday morning we were gone for Seremban. 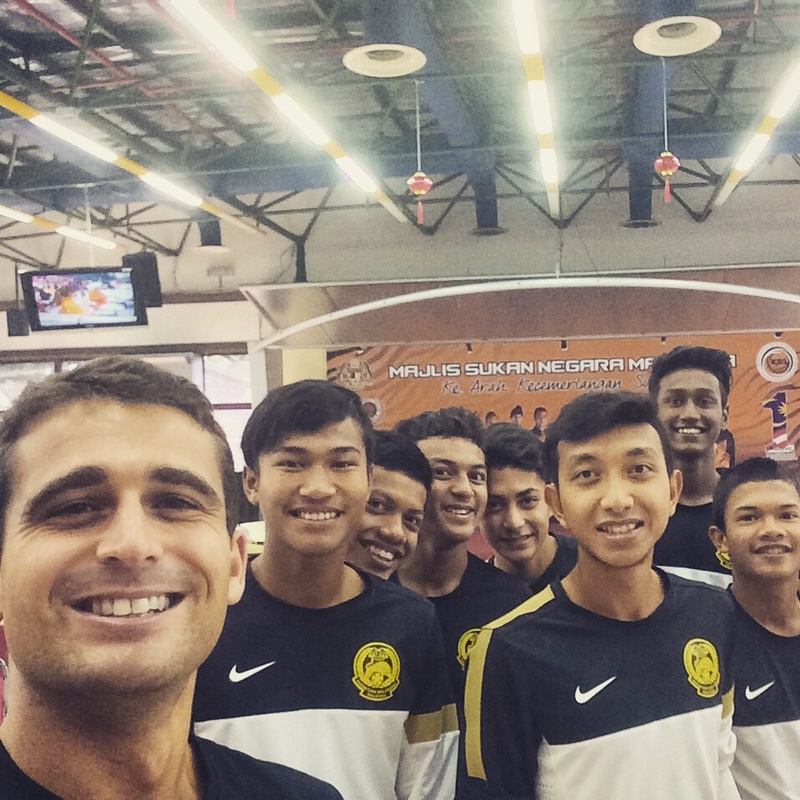 I snagged a spot on a school bus of players and with a few twists and turns, climbed out of Kuala Lumpur and into the highlands of the region of Negeri Sembilan, far away from everything and closing in on the tournament and His Royal Highness himself. Turns out we weren't headed to the capital city of Seremban, or any city. If you got lost driving toward Seremban and then got lost again, you'd end up in the rural village of Kuala Pilah somewhere in the Malaysian countryside and hours from anything. And that's where we went. Wandering sheep and goats grazed in the road as our school bus sped by and our skilled driver deftly dodged the roadside herd of cows and occasional pack of monkeys who seemed as confused as I was as to why we were here. Nothing about this place hinted of hosting a professional squash tournament- or a professional anything, really. 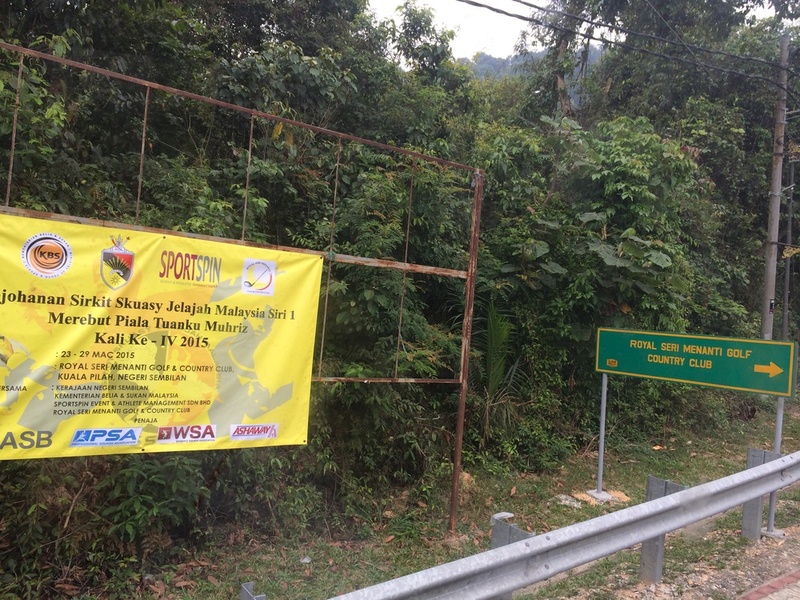 But the Royal Highness of Negeri Sembilan happens to love watching squash, and so sure enough our bus slowed to a stop at the top of a hill on the outskirts of the village, bordering a thick forest of jungle where we were warned "no man has entered before." We had arrived at the Royal Sri Menanati Golf & Country Club where two beautiful, spotless, brand new courts awaited us. I bunked at the Melang Inn with two British buddies from past tournaments- Adam Murrils, a 25 year-old and #128 in the world, and Alex Noakes, a 19 year-old just outside the top 200. I shared a bed with Alex and in the first round got thumped by Adam, who would go on to reach the semi-finals. At the welcome dinner banquet for the tournament I sat at a table with the Brits and a few other friends playing the pro women's event- Cheyna Tucker and Alexandra Fuller from South Africa, Lotte Erikson from Norway and American Maddy Gill, the Stanford women's #1 taking a gap year to play the tour. It was a luxury to be with friends who doubled as teammates for this tournament. We scooped homecooked Pakistani-style chicken and fried rice out of a massive bucket made fresh from a friendly Pakistani volunteer in the village, picked apart Malaysian barbeque ribs hot off the grill outside, laughed and watched and wondered what exactly was going on as local musicians and dancers welcomed us to Kuala Pilah, rural Malaysia. I had just about given up hope when he arrived. 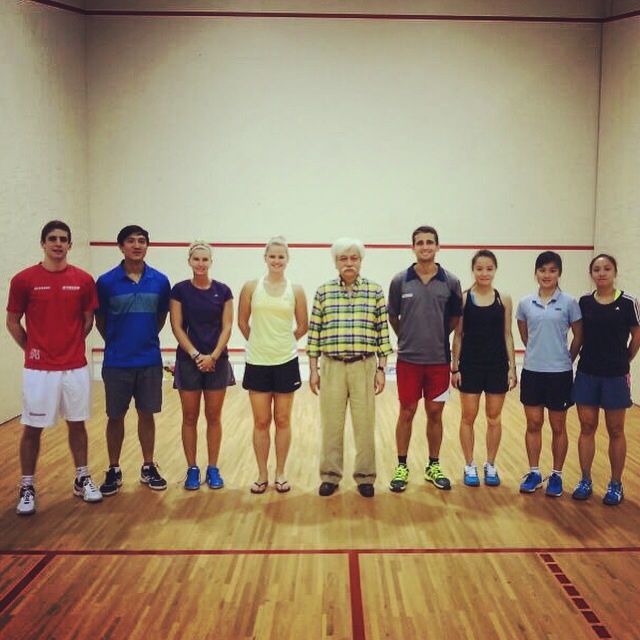 It was my last morning in Malaysia and I was on court practicing my Malay ("obagus!") 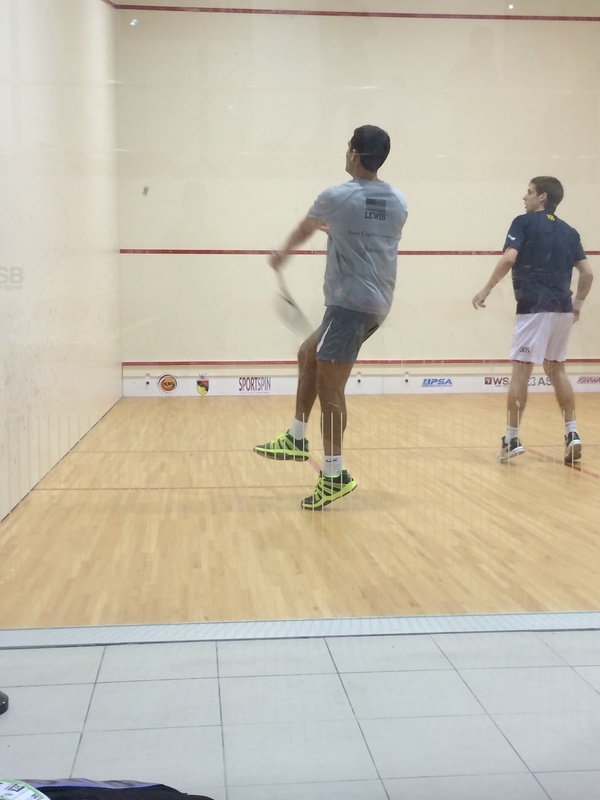 while teaching squash to forty eleven-year olds when,in an instant, things suddenly seemed serious. The kids' teachers started to shuffle outside the court, cleaning up the area and fixing their hijabs. A police officer walked into the entrance and a well dressed waiter laid out two bottles of water at the main table in the entryway. Out the back window, sirens flashed from the road as a motorcade of police cars and motorcycles escorted the Sultan of Negeri Sembilan, one of the nine royal sultans of Malaysia, into the parking lot. Emerging moments later from what had to be the only shiny black Bentley in all of the village of Kuala Pilah walked an elderly man dressed in plain courdory pants, a plaid button down shirt and a thick, neatly combed moustache. His Royal Highness had arrived. Spectators parted as he walked down the stairs and everyone in the building bowed as His Royal Highness made his way onto the court. I quickly bowed too, and kept bowed for an extra few seconds just to err on the side of caution and not be the guy who unbowed too soon. At that moment I wished I knew more about Malaysia, wished I knew how to say something more than "good!" in Malay, wished I wasn't so sweaty while now standing next to the sultan himself. He didn't seem to mind. He smiled as we shook hands, someone told him I was from America and at that moment I couldn't help but smile too- the king and me standing on court in middle of nowhere Malaysia, on the edge of a village and a jungle, on a Thursday morning unlike any Thursday morning I've ever had. I didn't know what to say. "So...really enjoy squash, I take it?" His Royal Highness of Negeri Sembilan turned to me and smiled.